Since 2013, “Open Top Tours” have been providing visitors an unique and intimate way to enjoy Nova Scotia in 4 X 4 Jeeps. We would love to take you on a day tour and excursion to visit local fishing villages, taste our amazing wines or simply relax on our spectacular beaches. Our multilingual guides are well versed and will share history & stories along the way. We are proud to offer you several tour options to suit your pleasure in all seasons. Whether you are in town for business or pleasure you should experience the beauty of Nova Scotia in one of our Open Top Jeeps ! Our guests visiting Halifax book us from various means such as directly through this website, through the hotels they are staying in, Cruise Ships or Train and walk bys when exploring the Waterfront. We offer direct pick up and drop off to your location whether it be from your hotel, cruise ship or other location. We can even offer drop off service to the airport at the end of your tour to maximize your stay! All tours can be customized to fit your needs. Our tour guests have come from all over the world as one can see by reading the Testimonials and Trip Advisor. The 2019 Touring Season bookings are now being taken and we expect this will be a busy year for touring and a great time to visit Halifax, Nova Scotia !.. Don’t be disappointed …book early ! We can accommodate larger group tours, please contact us for information and booking. 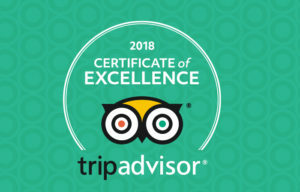 We’re pleased to announce that Open Top Private Tours has been recognized with a 2018 Certificate of Excellence, based on the consistently great reviews that we’ve earned on TripAdvisor. 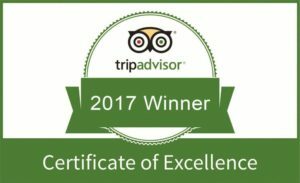 Only select businesses receive a Certificate of Excellence. Thank you to all our guests ! Three years in a row 2015, 2016 and now 2017. Halifax has recently been voted #4 of the Top Destinations on the Rise in the world according to TripAdvisor !